Until the ascension of a reformist leader in Prime Minister Abiy Ahmed, Tigrayans formed the backbone of what was the Ethiopian government’s oppressive establishment. For decades, the ruling Ethiopian People’s Revolutionary Democratic Front (EPRDF) government coalition had always been a facade for a powerful clique of Tigrayan People’s Liberation Front (TPLF) officials. Life for the common Tigrayan on the other hand, around 6% of Ethiopia’s population of 100,000,000, has hardly been any different than that of their fellow nationals. Tigray’s infrastructure still remains heavily neglected. 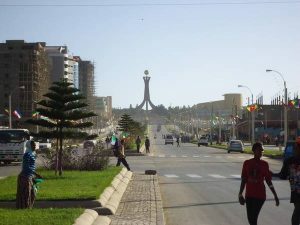 Electricity outages and water shortages are all too frequent, even in urban zones like Mekelle. 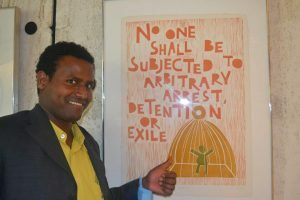 Political dissent, criminalized and often equated to terrorism by the state, has always had equally dire consequences in Tigray like elsewhere in Ethiopia. And yet Tigrayans (also called Tigreans) have long been accused of turning of a blind eye to years of government abuses. Many Ethiopians openly wonder why outspoken criticism of the regime had always been muted in Tigray. The misconception that this is due to Tigrayan unbridled support of a regime dominated by their kin has unfortunately led to incidents of innocent Tigrayans being targets for extremist violence. In a recent incident, a mob killed three employees of the Tana Beles Sugar factory, for their merely being Tigrigna speakers. Nothing justifies horrific acts of violence. But should it be puzzling that in the age of the “Qeerroo” becoming a household name, Tigrayans were almost never seen taking to the streets of Tigray to denounce abuses of the TPLF led EPRDF run police state? Not really, says Dr. Aregawi Mebrahtu, a co-founder of a Tigrayan civil society group. 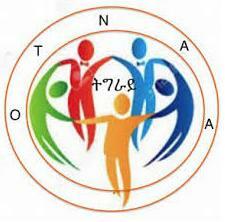 Seeking to collect funds and harness expertise from the diaspora, the OTNAA intended to set up shop in Tigray. The idea was to get official designation as a local NGO. 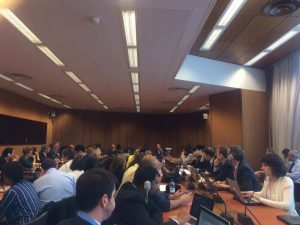 Members were recruited, meetings were held in Addis Ababa, all seemed on pace and the Tigray regional government appeared to welcome the initiative. OTNAA never got an answer for their application. They’ve sent subsequent applications none of which were accepted. The organization was left hanging and given no explanation. For now, it remains an NGO recognized and registered by the government of Switzerland. So why aren’t Tigrayans demanding more? Fetaw explains that the regional government has deployed an extensive network of cadres across Tigray that it uses to promote its narrative and listen in on what people are saying. Dubbed the “1 to 5” network, the state initiative pushes to have one person responsible for either indoctrinating or keeping five others in line. Rogue thinkers are quickly reported, detained or put under additional surveillance. Fetaw spent over a decade in Sudanese refugee camps registered under the United Nations High Commissioner for Refugees (UNHCR). In 2012, he was granted asylum by the government of Australia. Just before he was to leave for a new life in Europe, Australian officials told him that his UNHCR documents were no longer valid. He would not be able to travel. “I am told that Sudanese intelligence was behind the cancellation of my UNHCR file. They work side by side with the TPLF. The entire time I was in Sudan, they would harass and threaten me. They nearly ruined me at the end. My Ethiopian travel documents were cancelled years ago by the regime. All I had was my UNHCR registered status, without that I would remain stranded in the refugee camp with nowhere to go. 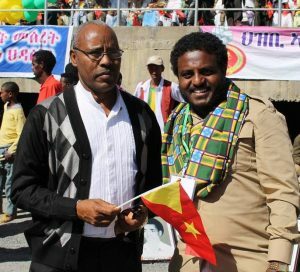 On the left, Gebremedhin Sebeho, better known as “Tertaraw.” Legendary TPLF fighter and singer of the renowned single “Aybelnando.” He had a well publicized falling out with the TPLF and slammed the then Ethiopian Prime Minister Meles Zenawi led government for what he called inadequacies in dealing with unemployment and the AIDS crisis. Despite being a public figure, he was detained, beaten and repeatedly threatened by police. He fled into exile in Australia in 2003 where he lived for many years (Image: Tekalgn Kelemu). 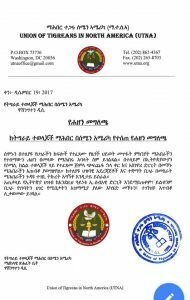 Verifying some of Fetaw’s claims is currently impossible and compounding the task is the fact that there are no independent media outlets in the whole of Tigray. OTNAA’s subscribers take to the organization’s Facebook page to lament the lack of available information portals in the region. To offer alternative views, OTNAA sometimes publishes news communiques via their website as well. Is the Tigrayan diaspora similarly muzzled? Ambassador Halefom is a leading member of the OTNAA’s North American chapter. 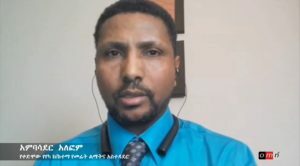 Formerly a member of Addis Ababa’s Yeka district development administration, in 2009 he moved to the United States where he has since acquainted himself with the Ethiopian diaspora. The UTNA is among the most well known diaspora based Tigrayan organizations, with a storied history spanning over four decades. But according to Ambassador, the UTNA’s primary focus shifting from development to political wrangling. 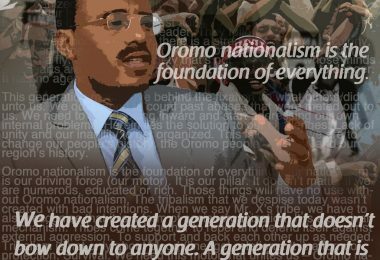 It’s leaders aggressively seek to indoctrinate Tigrayans in the diaspora into maintaining a hardline pro TPLF stance. Ambassador Halefom continued to place himself in the firing line of TPLF apologists. He is now a renowned critic of the organization who has slammed its leaders for a track record in government marred by human rights abuses and corruption. 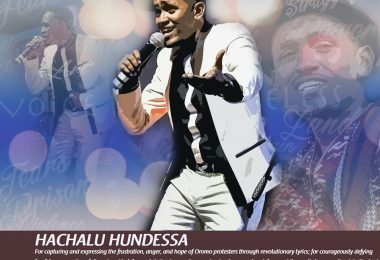 His status as a foe was solidified earlier this year when he agreed to a lengthy televised interview with the staunchly anti-TPLF Oromia Media Network, in which he articulates these viewpoints. In recent times the UTNA has been known for using national tragedies to issue rather polarizing communiques. 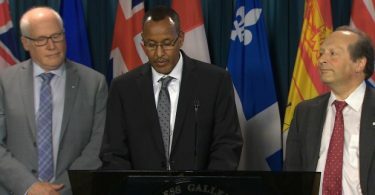 In December 2017, in response to communal violence displacing a million Oromos and Somalis from their homes, the UTNA issued a communique condemning acts of violence, “especially heinous killings perpetrated against Somalis.” Snubbing any mention of Oromo victims was widely seen as a thinly veiled slight by the UTNA at the people who led the largest anti government uprising between 2015-16. In another incident last January, the President of the UTNA, Alula Solomon posted an update to his Facebook page in which he alluded to members of the Oromo “Qeerroo” movement being terrorists. In recent months, opposition media outlets have being allowed to operate in Ethiopia, an amnesty bill being footed by parliament seeks to decriminalize a host of organizations once deemed terrorist groups. These measures are encouraging, but the trend hasn’t reached Tigray says Dr. Aregawi. Many support TPLF for reasons of ethnic pride and advantage. Never the less, I can imagine how much the people of Tigray must be policed.